Hundreds of people have so far engaged with a new campaign which seeks to explore how Tamworth town centre can evolve and grow for the future. 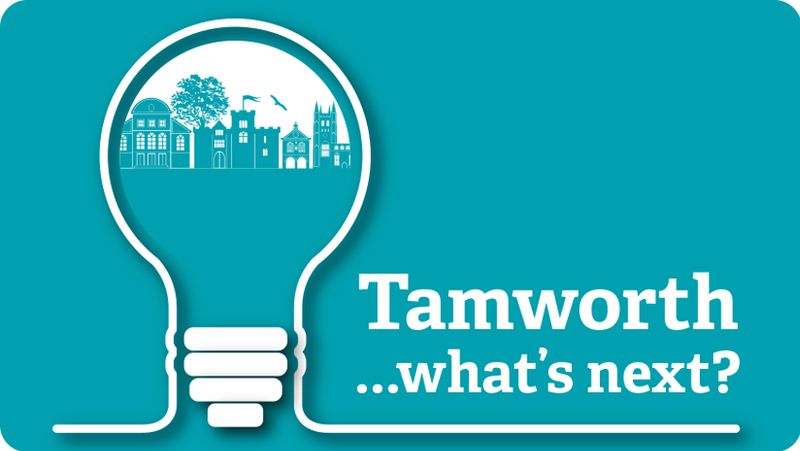 Tamworth Borough Council is asking businesses, residents and visitors to come forward with positive, viable ideas about what the town could and should offer to ensure it is a thriving, successful place that people want to visit. Since the launch of ‘Tamworth… What’s Next?’ less than two weeks ago, the campaign has reached tens of thousands of people on social media. Hundreds of people have commented online and another 125, and counting, have submitted their ideas via a short survey form at www.tamworth.gov.uk/tamworth-whats-next. Printed copies are also available in the Tamworth Herald newspaper. The majority of people who have submitted forms have also registered their interest in attending future workshops with the Leader of Tamworth Borough Council, Cllr Daniel Cook, with the aim of exploring some of the ideas further. While the suggestions are many and varied, there are some key themes emerging, including the need for a wider variety of niche and specialist shops, more family-based activities and destinations, a greater selection of food and drink establishments and more focus on culture and the town’s rich heritage. People have also called for more connectivity between the town centre and Ventura Park. Cllr Cook, who appears in the Tamworth…What’s Next? video, said: “Town centre regeneration has always been a priority for this council, but we’re now putting more focus on it than ever before. We want to evolve the town to ensure it can thrive for the future, and we know people have strong opinions on it. This campaign is about harnessing that knowledge and teaming up with people who are willing to help us move forward with the town centre. “I’m over the moon with the response so far and would like to thank everyone who has taken the time to submit ideas, and all the people who have said they are willing to take part in future workshops. We are starting to build up a database of local businesses, residents and visitors who are willing to come to the table with positive action for the future. “I will be arranging workshops in the near future where we can explore the ideas further and hopefully start to hone in on those that have real potential. “The overall aim of this is to develop a new vision for the town centre, rather than focusing on the past. While a lot of this will be a long-term project as change cannot be effected overnight, we will be looking to see whether any of the ideas can be implemented more quickly. Tamworth Borough Council is also aiming to bid for a slice of the cash available as part of the Government’s new £675m Future High Streets Fund - and consultation with the public about what improvements are needed is a key part of that. To take part in the debate, people are encouraged to start by watching the video, which can be viewed via the Tamworth Borough Council Facebook page, or at www.tamworth.gov.uk/tamworth-whats-next, where we have created some new webpages which summarise where we are now, including the answers to some frequently asked questions on topics such as business rates, property rents and car parking charges. Ideas can then be submitted via a short survey form asking visitors, residents and businesses to tell us how often they visit the town centre, what would encourage them to visit more frequently and what they think would help increase footfall. If people are happy for their ideas to be shared, these will then be put out across Tamworth Borough Council’s Facebook and Twitter channels and will help inform the development of a new town centre strategy and the Future High Streets Fund bid. The webpages also include useful links for businesses around the various business grants, conservation grants, advice and support that is available.